Substraters are all over the Web (and our blog). Vlad Barash has posted a new excerpt from his WIP LukOL. If you like MMOs or music or both, make sure you catch the tidbits we've got up! Next, Madeline Miller's Song of Achilles is listed as a "great reads at a great price" for the nook! If you haven't bought it yet, check it out! Both Max Gladstone's Three Parts Dead and Madeline's Song of Achilles were chosen as must read books in the Massachusetts Book Awards, which makes them both finalists for the award. Congrats, Max & Madeline! It used to be that on Tuesdays, I'd open my LJ feed and get bombarded with teasers from the various authors I followed. I don't know that Teaser Tuesday is still a thing, but after chatting with the other Substraters, we decided we'd promote that old tradition with our own Tuesday Tidbits. Each Tuesday (we hope! ), we'll be posting a tidbit over at the Substrate blog from our various works. This week, Vlad Barash kicks us off with an excerpt from his current WIP, LukOL. I hope you'll check it out, and if you're not already subscribed to our feed on LJ, you can do that here. Other folks are also making new appearances online -- I just discovered that Baeg Tobar writer friend Daniel Tyler Gooden has a facebook page for his writing. He's currently promoting his recent self-published novel, Cinnamon, Cayenne, and Fire. My PW editor for SFF reviews, Rose Fox, who blogs over at Genreville, is soon to be editing a Kickstarted anthology, Long Hidden: Speculative Fiction from the Margins of History. They've just hit a stretch goal that will be opening them to more submissions, and if they hit the next stretch goal ($9000 away with 12 days left), they'll be increasing the art to go in the anthology. I'm very excited about this book, and I hope that more folks will consider contributing, especially if you appreciate multicultural speculative fiction. Clearly I'm promoting more Kickstarters than I used to -- what Kickstarter projects do you think deserve some extra love? A long time ago in a galaxy far, far away (or at least a life that was far, far different), Nat Rowe introduced me to a lot of writer types he'd gone to Yale with. Not to be outdone, I sought out some writer types from Simon's Rock, and notadoor/S. K. Gilman and I joined the throng of Yalies to create a very awesome and fun crit group that hasn't met in far too long. But I have been thinking about Substrate quite a lot lately, in part because I got a fantastic rejection letter (I say this without a trace of sarcasm -- it was a full on critique from the editors) from Tor.com. I'll be giving the piece I submitted another look with the help of the Substraters, and will see if I can't find a good home for it once I've applied some additional feedback to it. 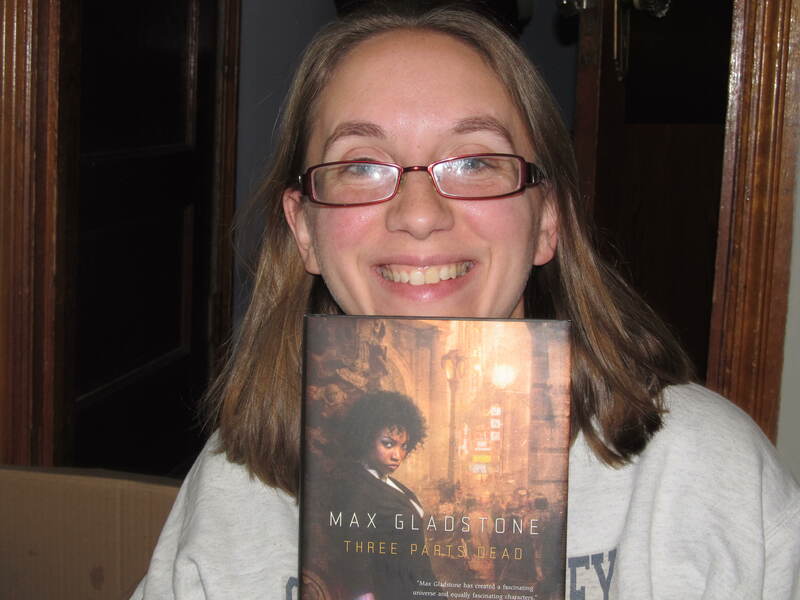 The other thing that has me thinking about Substrate is, of course, Max Gladstone's release of his debut novel Three Parts Dead, which I cannot rave about enough. I loved it as a manuscript, and the physical book is a beautiful product that is even nice to hold (as you can see I'm enjoying doing in the photo below). So in honor of Max's publication, I cleaned up the old Substrate group blog, which had apparently been hacked by a Polish blogger. I'll be posting news about Max and other Substraters (as we have news to share) over at that blog, which does have a livejournal feed. You can follow us here at livejournal or over at Virgil & Beatrice. And if you're in Bethesda, MD on Monday, you can catch Max at the Barnes & Noble doing a signing. More detail's on Max's page. I got next to nothing done that I'd had on my list to accomplish today. Someone asked me to post about finding a writing group awhile back, and the truth is, I don't actually have really good advice. I fell into this one almost by chance -- Substrater Nat had an inkling about getting a group together when lyster got back from China and did most of the inviting of folks who, then, I didn't know well and had never read. I invited notadoor, who I'd met briefly at Simon's Rock when I'd gone back on TA prep for one of Mark Vecchio's study abroad courses, and who I'd gotten to know (and admire) via LJ. Most of us write, and are interested in, the same kind of fiction -- F/SF stuff, largely. We write in different areas of the genre, and we bring different opinions as readers to the table. And, this is kind of important -- we all seem to like each other. I don't know if that's critical for a writing group, but I've found it's really important for a gaming group, and I think the two are more similar than might seem obvious at first appearance. But as far as writing itself goes, I wrote a few new sentences in a review that's due on Monday... Yeah, not exactly an inspiring total. On the other hand, Twostripe and I spent some time reading Off Armageddon Reef by David Weber (it's our family read aloud book right now -- we've done The Hobbit, Unseen Academicals, and, as you may recall, the last two books of "The Dark Is Rising" sequence since Bug was born. Picking grown-up books means that progress is sometimes quite slow. But we kept going ahead in Off Armageddon Reef after Bug fell asleep tonight. I'm hoping she won't notice.) Spending family time together, especially over a good book, was an excellent use of time, despite meaning that I didn't get to check anything off my to-do list. Tomorrow is a Christmas pageant at church, which I'm excited about, and then perhaps I can be constructive in the afternoon. Here's crossing my fingers! Web page updated -- hooray! I've been meaning to update my page for awhile, and it occurred to me today that there wasn't a way to contact me through the site, so all I was going to do was add that page and be done with it. There are galleys to proof, gosh darn it! A few hours later, and the page is fully up to date. I'm quite pleased with it (despite that not having been on my list of things to do today). The Substrate blog is now linked to the front page, which means we really should get cracking keeping it updated! I hope you'll pop by and check out the site (and tell me if I accidentally broke anything while updating -- I am not an html magician, despite the Taru icon for today's entry). In additional good news, the FTC announced that they didn't really mean book bloggers when they were talking about their new requirements. I think I'll stick with the safe side (and hey, I don't care if you guys know I got an ARC or won a contest or however I got my books). One quick and important news announcement: Ransom: The Anthology is going out of print at the end of the month. Edited by Dylan Birtolo ( eyezofwolf), the collection features my short story, "Don't Let Go," (which has, in short form, part of my treatise about religion, folk tales, and fairy tales), as well as a host of excellent stories by other authors. Get it before it can no longer be gotten! At any rate, while going through my library books, I picked up Everyday Immortality: A Concise Course in Spiritual Transformation, which I'd picked up off the shelf in the comparative religion section (Dewey: 204.2) and thought might hold some interesting thoughts for excerpting. Little did I know that it's similar, in some ways, to a Christian devotional book. The devotional readings I've done have primarily been short essays, or excerpts from the works of Christian scholars, coupled with Bible verses they illuminate. They're meant to provoke thought and consideration. In Chopra's book, the intent is the same, but the method is different. On each page, he offers a sutra or koan, one simple sentence jam packed with possible meaning. He recommends meditating for five to ten minutes, reading a passage, then meditating on it thereafter. If it immediately makes intuitive sense, move onto the next sentence. Instead of being guided by an accompanying message, the sentences themselves are the message -- as is what the reader brings to them. Subatomic particles are not material things; they are fluctuations of energy and information in a huge void. Subatomic particles flicker in and out of existence depending on whether I am watching them or not. Before my decision to observe them, subatomic particles are probability amplitudes of mathematical ghosts in a field of infinite possibilities. When I make the choice to observe the subatomic world of mathematical ghosts, the ghosts freeze into space-time events or particles that ultimately manifest as matter. My physical body and the body of the physical universe are both proportionately as void as intergalactic space. The essential nature of my material body and that of the solid-appearing universe is that they are both nonmaterial. They are made up of non-stuff. "Big Deadline Is Still a Thing of Madness"
... and so I'm not here, but I did quickly post to the Substrate blog today. I got back yesterday from a wonderful, busy, and very full weekend in Chicago. It went by far too quickly, and my next trip to Chicago will definitely have to be a longer one, so I can not only fit everything in, but also say hi to the folks who live there who I didn't have time to get in touch with this trip. Highlights of the weekend include taking the tall ship Windy out on the water (I got to help hoist the main sail), touring Chicago's Sky Chapel, going to a Common Shiner concert, and generally spending time with my sister, who I hadn't seen in ages. Full weekend, lots of fun, and I'm still a little exhausted and recovering.